I read a lot of books. Some of the books are for pleasure, and most are for study, in conjunction with my work as a pastor. For the past three years I have published a “Top 10” list of the books I read each year. You can check out those lists here, here, and here. Although we’re still relatively early in 2019, I think I’ve already read the book that will be number one on my list for this year. 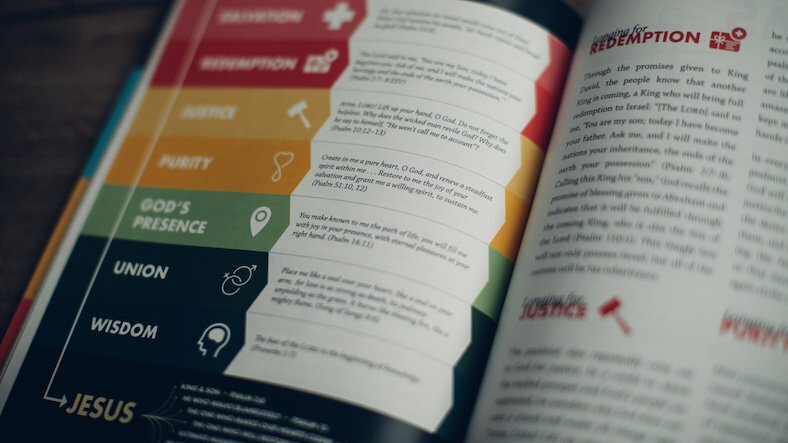 A couple of months ago I pre-ordered a copy of A Visual Theology Guide to the Bible by Tim Challies and Josh Byers. I was excited to get the book for two reasons: 1) I read Tim Challies’ blog regularly and really like his writing, and 2) I love infographics! I received the book last week and have already read it through, which is not something I usually do. Let me be to the point: you need to get a copy of this book. If you only purchase one book this year, it should be this book (unless you need a new Bible, then definitely go with the new Bible). This book is unique in a variety of ways. I guarantee that you have never read another book like this one. It’s almost something you need to see to believe. 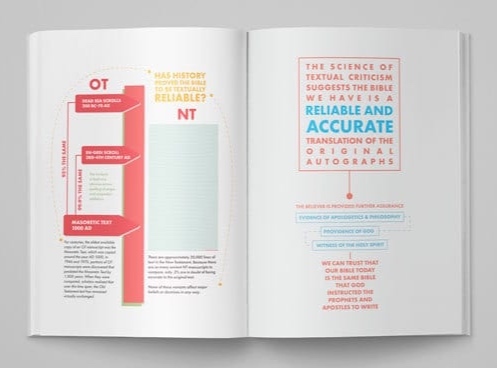 Each page of the book contains written information, but there is also at least one graphic design that accompanies the block of text, visually communicating what was written in the text. And on many pages, the text is the graphic. Don’t confuse it for a picture book. The graphics in this book speak in ways that text by itself simply can’t. It’s a fascinating and first of its kind (as far as I know) approach to writing and communicating in book form. The book is broken down into three parts: 1. Trusting the Bible, 2. Studying the Bible, and 3. Seeing the Bible. The first part is a defense of how and why the Bible exists. It covers issues such as textual criticism, numbers of biblical manuscripts, languages of the Bible, dates of writings, how the canon was formed, the accuracy and reliability of scripture, and so much more. The second part covers things like how to read the Bible, looking at different genres, memorizing scripture, methods for studying the Bible, and so on. But remember: it doesn’t just communicate these things by the use of text, but also (and primarily) graphically. You will spend as much, if not more, time looking as you do reading. The third section of the book tells the overarching story of the Bible, and shows how the whole thing is pointing to Christ and his work in and through the gospel. But I guarantee that it does so in a way that you’ve never seen before. You’ll see infographics on Asbraham’s travels, the conquest of Canaan, the cycle of the Judges, a layout of the Tabernacle, the prophecies of Christ’s coming, Jesus’ miracles, a defense of the factual nature of Jesus’ resurrection, and so much more. 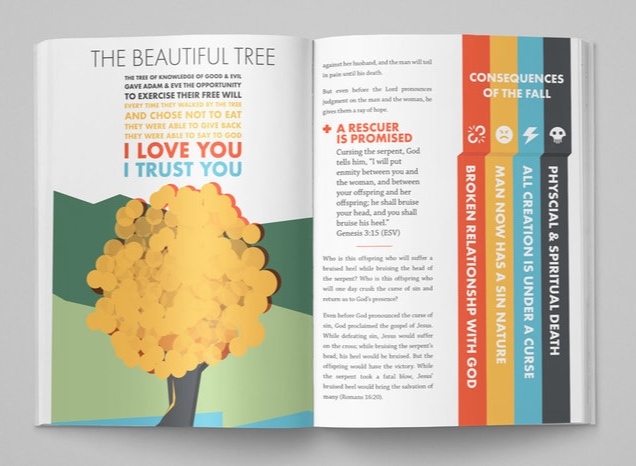 My personal favorite graphic from this section is the one on the book of Psalms. Not only is this book well written and beautifully designed, but perhaps the best feature about it is its utility. That is, this book is incredibly useful. Christians would do well to read this book in tandem with their regular Bible reading. It will compliment your study of scripture incredibly, and it will do so in a unique, engaging and, dare I say, entertaining way. You will benefit from your Bible reading by reading this book. And you will enjoy reading the Bible more if you read this book. That may sound like an overstatement, but that’s how wonderfully done this book is. There are few other books that I would recommend for non-believers more than this book. Although it is primarily about the Bible, this book has a distinct apologetic flavor to it. Not only does it teach the Bible, but it also defends the Bible, and it does so in a way that will not be off-putting to unbelievers. Sometimes I feel like Christian publications come with a certain “cheese ball” factor that a reader or consumer has to “get over” in order to actually receive the message. Not so with this book. The medium is the message, and the medium of this book presents the message in an absolutely engaging way that pretty much anybody - believer or unbeliever - will be pulled into. If you have an unbelieving friend, or a family member who has ever asked questions about the Bible, its reliability, or its message, this is the book that you should give to them. Seriously: if you can, get yourself a copy of this book. Or check it out from Riverview’s library.